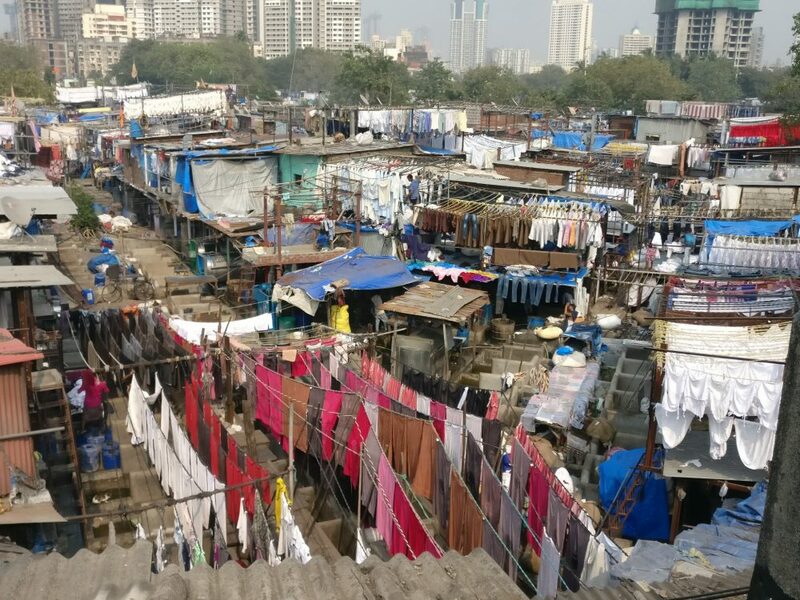 After our tour of a Mumbai slum – see this post from last week about the Dharavi slum tour – my colleague and I spent the afternoon visiting some of the more popular tourist destinations in the city, led by our guide, Jitu, from Reality Tours. 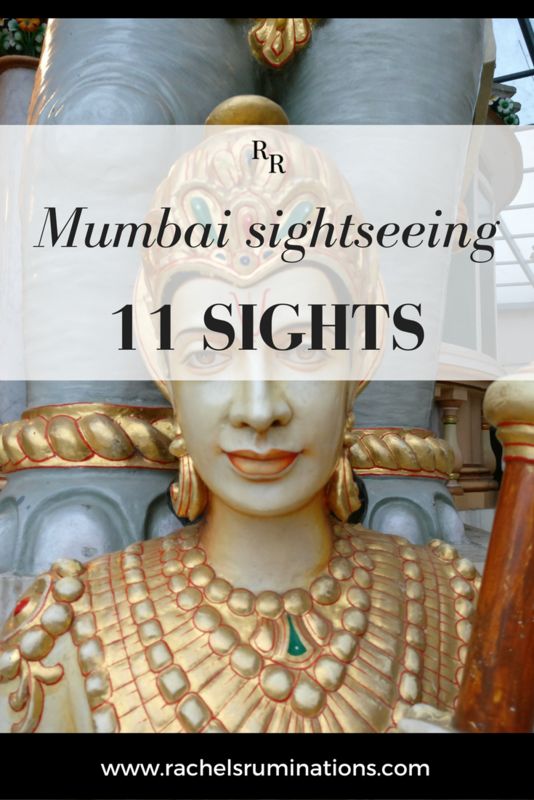 Here is my take on Mumbai sightseeing: 11 sights, not in the order in which we saw them. 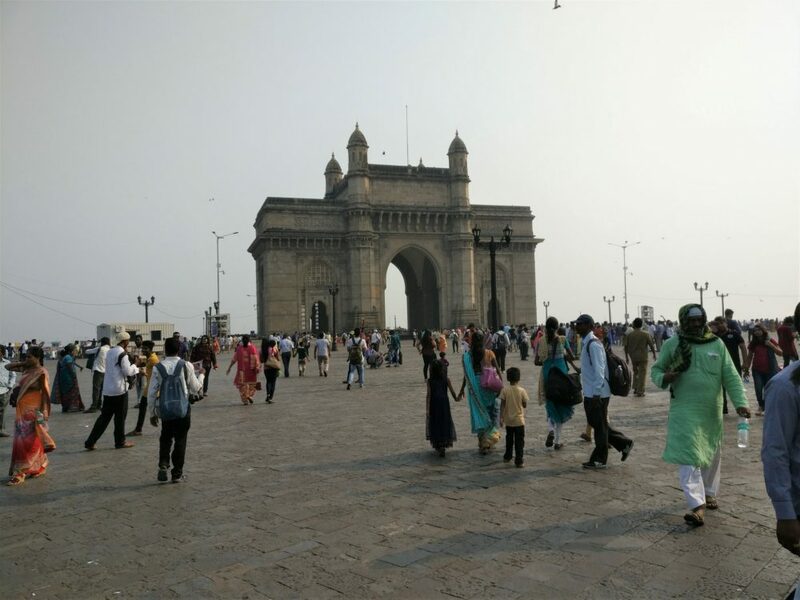 My preconception of Mumbai – and all of India, for that matter – was that the majority of its inhabitants are Hindu, with the remaining population being Muslims. I was wrong: other religions are also represented. When I did a bit of on-line reading about what to see in Mumbai, It surprised me to discover that Mumbai has a Jewish heritage. Three distinct groups of Jews moved to Mumbai in the 1700s: one group from Iraq, one group from Kerala in southern India called the Cochin Jews, and a third group called the Bene Israel from the south as well. The Cochin Jews claim ancestry back to King Solomon and were certainly in southern India by the 13th century. The Bene Israel have a murkier history, and some believe they could be one of the lost tribes of Israel. 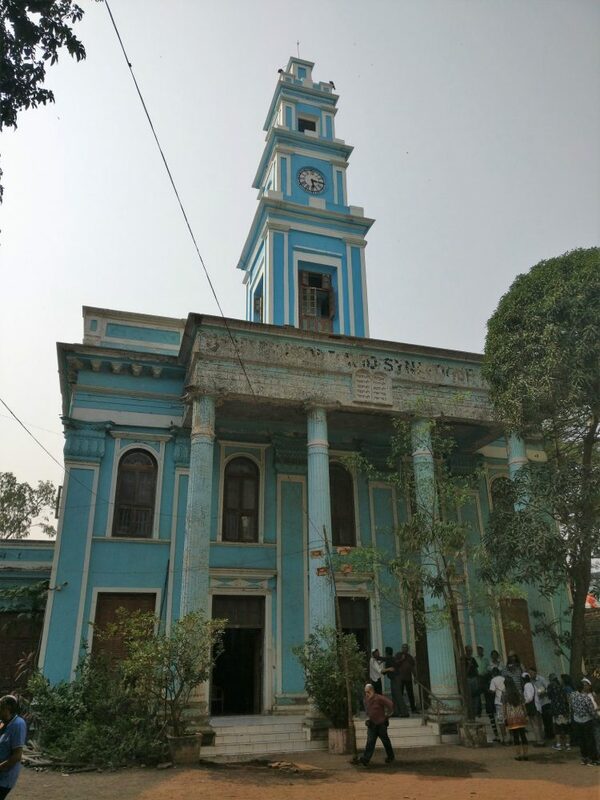 In any case, while there are only a few thousand Jews in Mumbai today, eight synagogues still stand. We visited one of these on our tour: the Magen David synagogue, also called the Sassoon synagogue since David Sassoon paid for its construction. 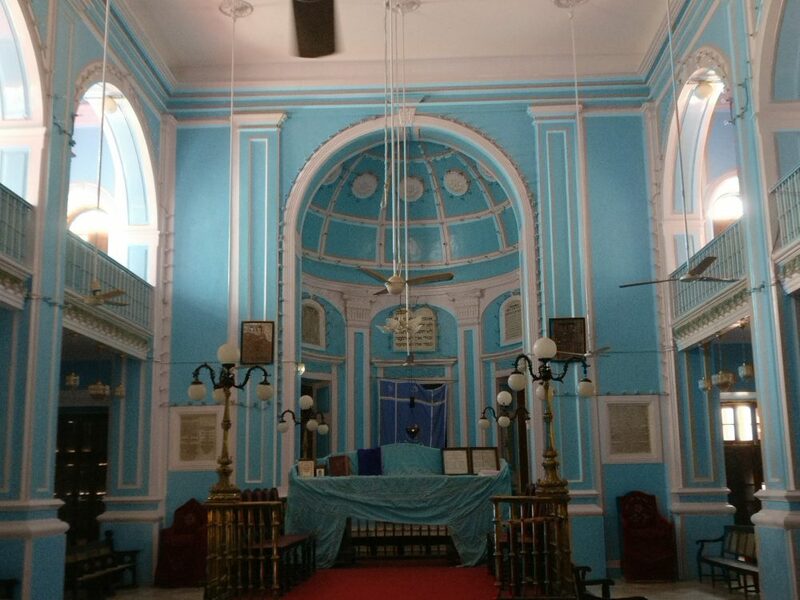 Built in 1864, it is the oldest synagogue in Mumbai. Badly needing repair on the outside, the synagogue is bright and light and cheerful on the inside: a cool, airy space. Next door to the synagogue is a Jewish school, also funded by Sassoon. Today, with such a small community remaining – about 4000 Jews, according to Wikipedia – the school is open to children of all religions. Visitors are required to remove shoes before entering; a sign warns not to leave them outside because they might “go missing.” Inside, the church has a homespun atmosphere: simple paintings on the walls illustrate the Stations of the Cross, and, like the synagogue, the dominant color is blue. Built about 100 years ago, the present church replaced one that burned down. However, the older church’s statue of Mary survived the fire. For that reason, it is particularly revered, and pilgrims come to pray to the statue. 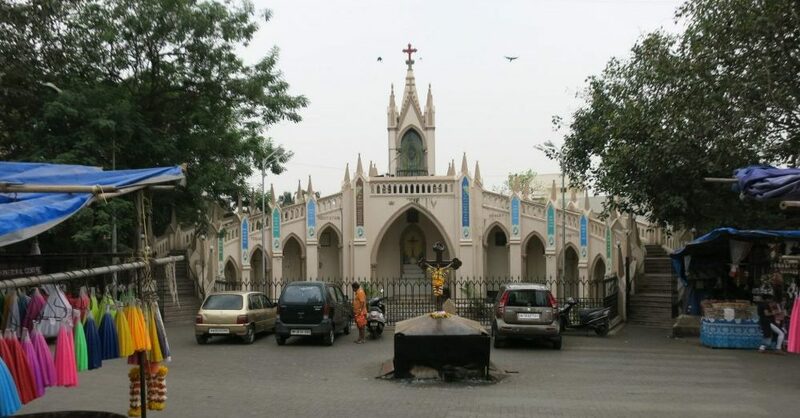 It is housed in a separate chapel facing the entrance to Mount Mary church. 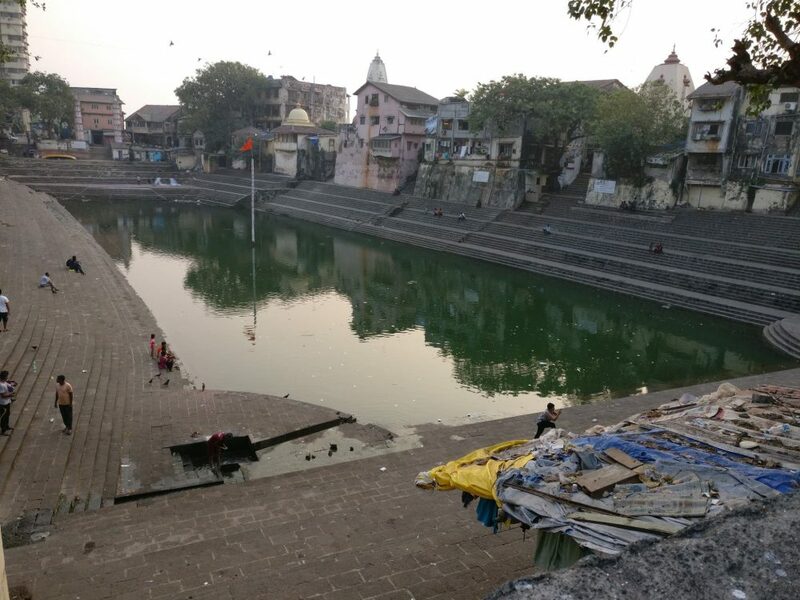 Banganga Tank is a large pool of fresh water surrounded by steps. Originally built in the 1100s, it is believed to contain water from the Ganges River, despite the fact that it is hundreds of miles away. For this reason, it is used for Hindu rituals that would normally take place on the shores of the Ganges: funeral rites in particular. In one corner of the rectangular pool, water flows from a spring. When we were there, a man was bathing in the spring water, but otherwise the place was almost deserted. Above Banganga stands a brightly-painted Hindu temple, the Venkateshwar Balaji Temple (1789), dedicated to Vishnu. We ventured in and, after taking off our shoes, Jitu explained that I should first clasp my hands in front of my chest and pray for a moment. Next we stepped into a bright white, empty room. Ahead of us was a doorway into another bright space with an altar visible on the far wall. As Jitu touched my arm to stop me from stepping over the threshold, he started to explain “No, visitors are not supposed…” He stopped when he saw what I had already seen: a man inside was enthusiastically beckoning me to come in. The inner room of the temple. The inner room was even brighter than the one we’d just left. The man summoned me to him and gestured for me to hold out my arm. Chanting a prayer, he rapidly wrapped a piece of yarn around my wrist. He did the same for Jitu, and for my colleague, Marie. Jitu tipped him, and explained to me that I should keep the yarn on my arm until it fell off on its own. If I had had more time, the area around Banganga tank would have been a good place to explore; apparently it is home to upward of a hundred small Hindu temples. 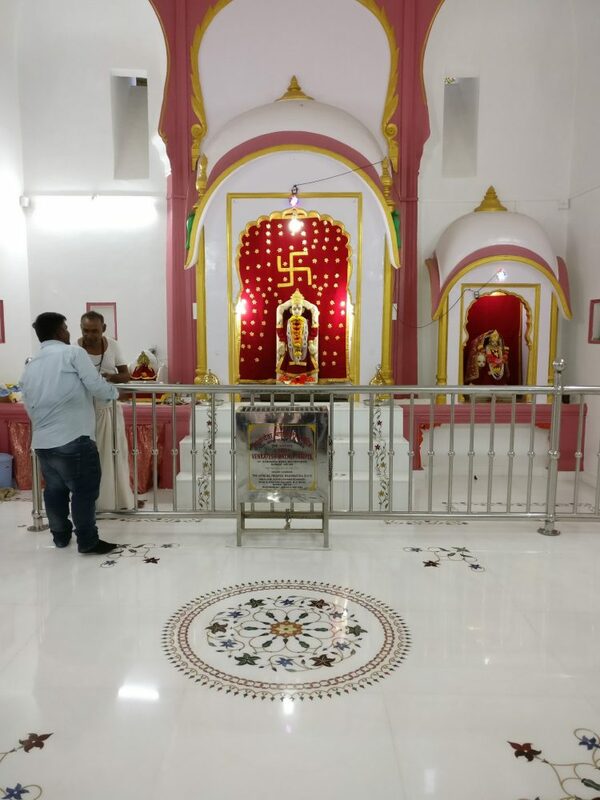 Our last religious stop was at a Jain temple, more properly called the Babu Amichand Panalal Adishwarji Jain Temple. Jainism is a religion that apparently emphasizes non-violence and asceticism and has elements in common with both Hinduism and Buddhism. The temple is ornate with carving and statues, brightly-painted. The entire courtyard in front of the temple has been covered in a curved, modern roof, which, in my view, diminishes the beauty of the temple. 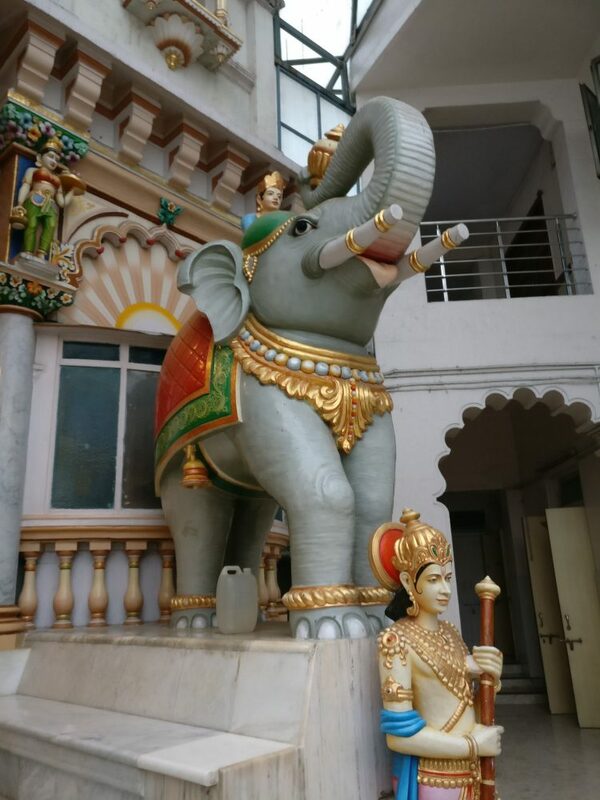 We enjoyed the sight of the life-sized elephant statues guarding the building. Unfortunately, tourists are not allowed past the building’s porch, so I only got a distant glance at the inside. The elephant statue in front of the Jain temple is guarded by a figure with a very expressive face. We didn’t get to visit a mosque during our tour, but I did see the most famous one in passing: on a small island off the west side of Mumbai, the Haji Ali Dargah is “an exquisite example of Indo-Islamic architecture” (Wikipedia). It is linked to the mainland by a causeway that is often covered by the tides. 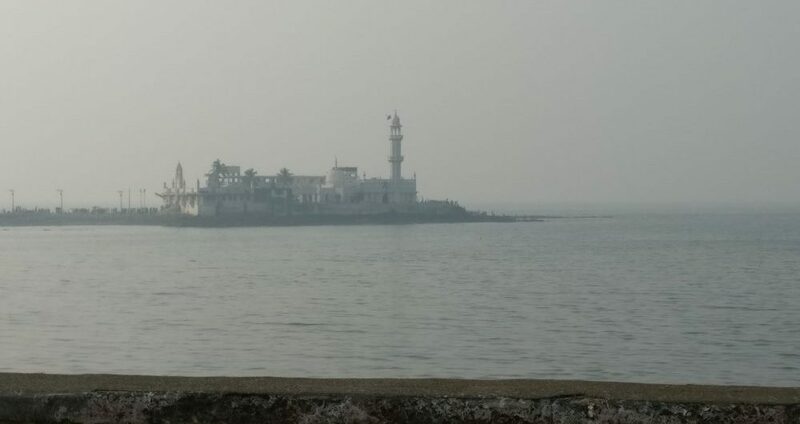 Haji Ali Dargah mosque, as seen from the Mumbai coastal road. It was extremely hazy with pollution when I visited. Is a Dharavi slum tour a good idea? Not all of our stops that afternoon were linked to religion. Dhobi Ghat, the largest open-air laundry in the world, has become a tourist attraction in its own right. We stopped for a few minutes on a bridge that affords a view over the operation. Since it was afternoon by then, we didn’t see any washing being done; instead, we saw vast quantities of clean laundry hanging on lines to dry. a view over a section of Dhobi Ghat, the massive outdoor laundry operation in Mumbai. 7000 people, according to Wikipedia, wash the laundry by hand in the separate concrete tanks we could see below the drying laundry. Once it dries, the workers iron and fold it to send back to their clients, mostly hotels and restaurants. Probably the most well-known landmark in Mumbai is the Gateway of India. A sort of triumphal arch, it was finished in 1924 to commemorate when King George V and Queen Mary visited Mumbai in 1911. I’m not sure why that occasion needed to be commemorated, though. In any case, the design combines elements of Muslim and Hindu architecture. The stone latticework in the side arches particularly impressed me. The Gateway of India. According to our guide, people from Mumbai never come here; the people in the picture are all from other parts of India, with a sprinkling of foreigners like us. While our tour only allowed us time to see the outside of the Taj Hotel, I went inside briefly the next day after my visit to Elephanta Island. 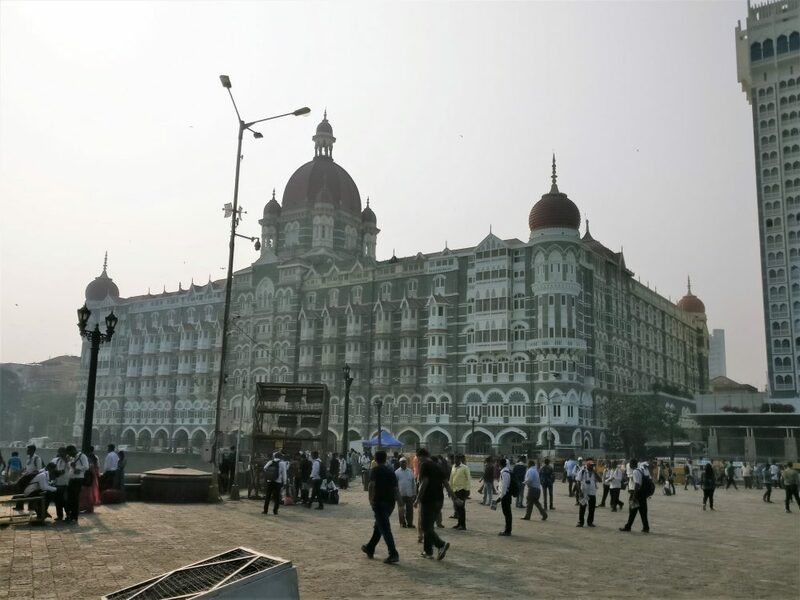 This colonial-era hotel (1903) – along with its more recently-added tower (1973) – is the most prestigious in Mumbai. The display inside showing some of the prominent past guests, including Barack Obama and Queen Elizabeth, bears this out. This hotel, incidentally, is the one where terrorists took hostages and killed 31 guests in a 2008 attack. 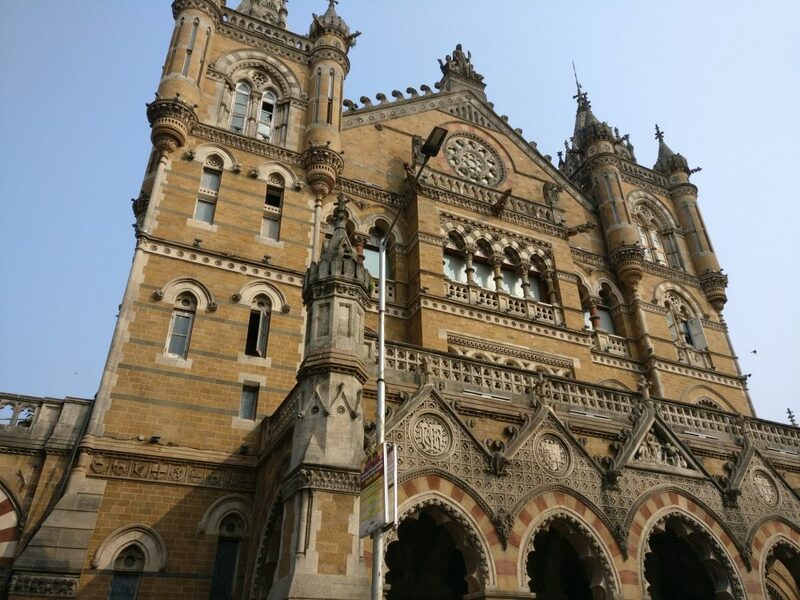 Also known as Victoria Station, this UNESCO World Heritage site is a glorious example of Victorian architecture combined with Indian architectural elements. We did not venture inside, but this gothic revival masterpiece certainly impressed us. A bonus was seeing the municipal government building across the street, also a Victorian gem. Like the Taj Hotel, Victoria Station was attacked in 2008: terrorists killed 58 people there. This photo shows just one wing of Victoria Station: it’s an enormous building. Our tour also passed what our guide (and a taxi driver the next day) called the “billion-dollar house.” The home of Mukesh Ambani, estimated to be worth a billion dollars. 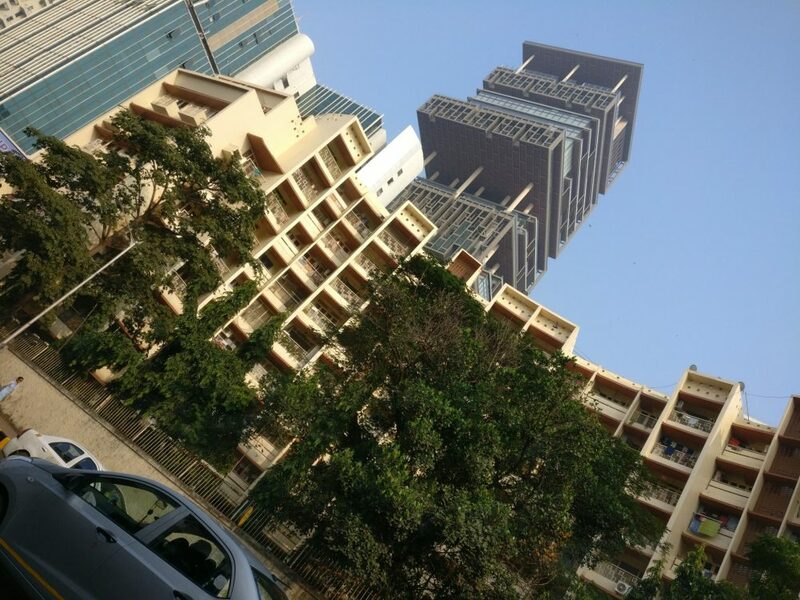 With 27 floors (the extra high ceilings make them particularly tall floors), it is nevertheless a single-family home, but also can house 600 servants, a multi-story parking garage, and for some reason, three helipads. The “billion-dollar house” is the dark, tall building sticking up behind the apartments in front. A striking contrast to a billion-dollar house in a city where 42% of the inhabitants live in slums, the Gandhi Memorial and Museum honors the life and work of Mahatma Gandhi. 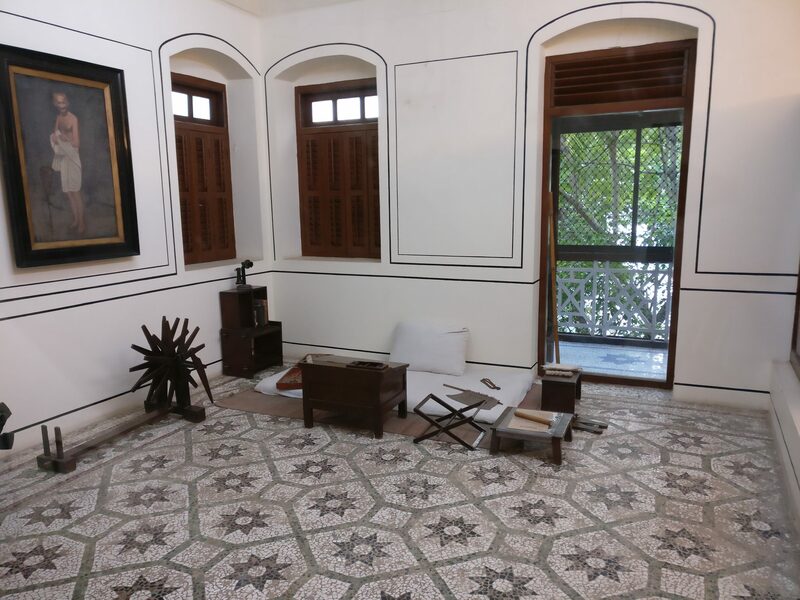 Housed in a friend’s home, where Gandhi stayed for 17 years, the museum offers information about Gandhi’s personal life and work and houses a research library. In one room, some of his correspondence is on display: a letter from Einstein, for example, and one he wrote to Hitler containing a plea for peace. Large wooden boxes fill another room, each one containing a diorama depicting an important event in Gandhi’s life. It’s an old-fashioned way to present the history, yet somehow it works. I also enjoyed the museum’s glimpses into his private life: his relationship with his wife, his grief when she died, and the preserved room in which he lived. Now that I’ve made this list, I realize how much we managed to see, given that we only had an afternoon for sightseeing in Mumbai. Have you been to Mumbai? 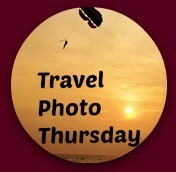 What would you recommend to anyone visiting Mumbai? I really enjoyed how in-depth this post was. And the pictures were just so lovely. You really got to see so much of Mumbai. Interesting to learn about the synagogues in India. You really did get around that day! I hope you had time to take it easy on some of your other days. 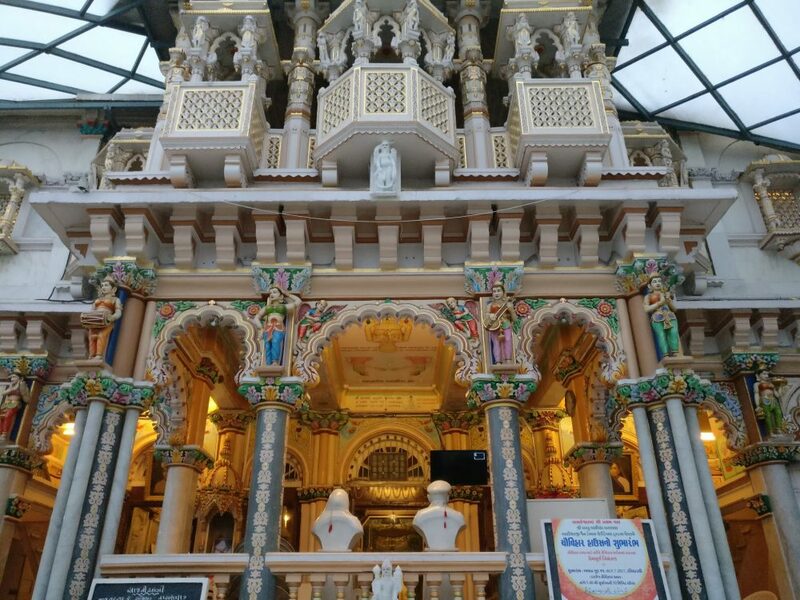 The first part of your day interested me most–delving into the array of religions represented in Mumbai. I’ve never been, but a visit to India is high on my wish list. We actually didn’t see all 11 things in that order, but I agree, the variety of religious sites interested me most as well. How timely! I’ll be traveling to India in January, and now I have a checklist for Mumbai. So excited! 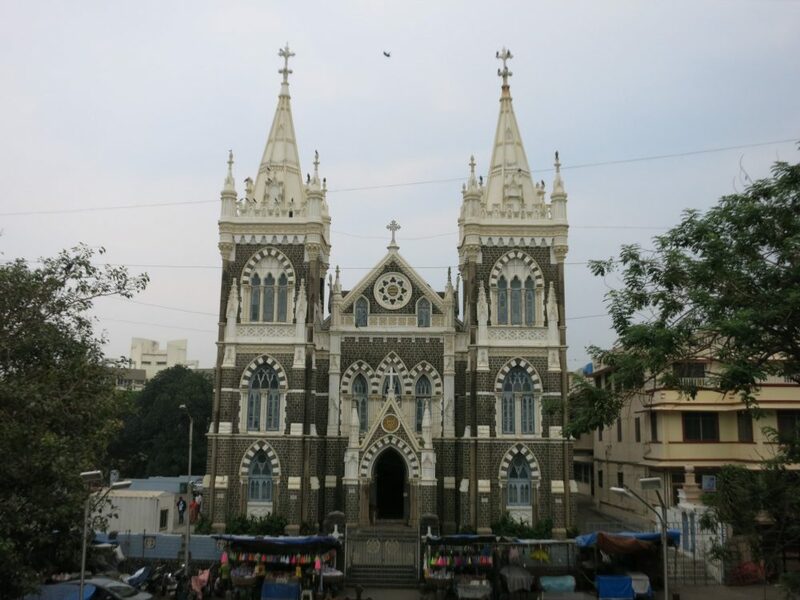 Great post.Mumbai is decent place in India to travel.Mumbai is also know as Bombay.It is a ancient as well as religious place to visit.Thanks for sharing your experience with us.Keep sharing.